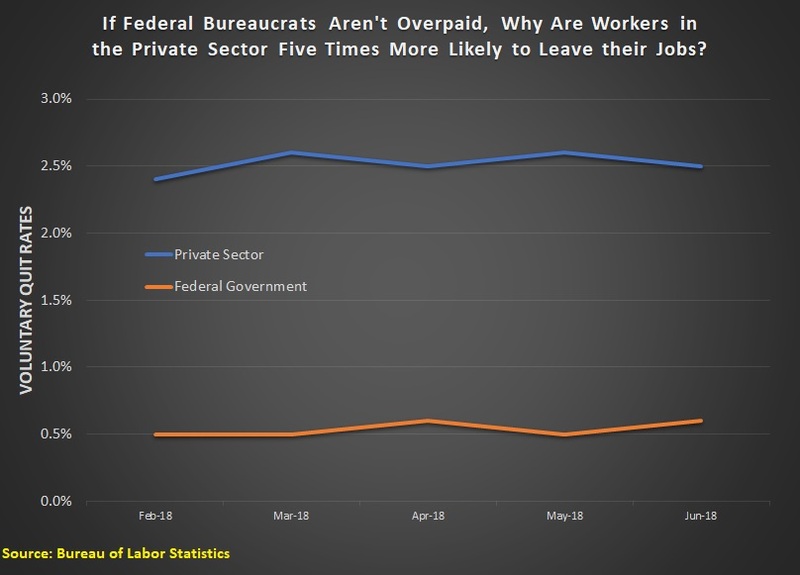 The problem with this study are all the “apples to oranges” comparisons since what should be compared are the same types of jobs in the private sector that are matched to those in the public sector – preferably in Washington DC. Otherwise, if you’re going to compare salaries in DC to salaries elsewhere, then you must adjust them for the differences in cost of living (which is much higher in DC than the national average). Private sector unions negotiate for contracts. Public sector unions use their powers of political extortion to gain their virtually automatic periodic pay raises. Taking defense out of the discussion, I pretty much agree, with the above caveat. Oh, there are a few other areas for the Fed’s, areas that are covered in the Constitution but not mentioned in your list. An example is the National Parks Service, BLM, Forest Service, as well as Fish & Wildlife. They are covered by the authority AND responsibility of the Feds to manage/care for Federal assets. Whether all the Federal lands out West SHOULD be in Federal hands is a policy argument, not a Constitutional one. Even the EPA has SOME constitutionally grounded authority. That authority though simply does not extend to being able to tell a homeowner in Hawaii what type of toilet he can purchase. There is ZERO interstate impact on the underlying Fed justification, whether it be commerce or environmental. Some Federal entities though? ZERO Constitutional basis. FEC, HUD, Education, Labor, HHS, SSA, SBA. Others have a nugget of basis, which if all of the nuggets were rolled together you might have a Cabinet Department sized entity. Agriculture, Commerce, Veteran’s Affairs, Energy, Transportation, EPA, FCC, FERC. Last, there’s a plethora of Federal entities that, while they may have solid or soft Constitutional grounding, are duplicating OTHER Federal entities. The clearest examples are the multitudinous Federal law enforcement entities. While whacking the baseless departments and agencies (along with their corresponding laws) will eliminate some LEOs, other redundancies can be eliminated by consolidation. I do NOT propose a single “superFed LEO agency”, just a big time “rationalization.” Note that a Federal gov’t along the lines of what I envision would likely have about 10%-15% the current number of LEOs. You can either have high wages and benefits or a secure job. Meaning if only a few government workers actually get fired for low performance than their wages should reflect the high job security. I live in Germany. For decades there was an unwritten law saying that government workers earn below average wages but will get high job security. And yes, that have been true for decades. The average German government worker did indeed earn lower than average wages but had tenure (real tenure or some equivalent). But times have changed here as well. Today more and more government workers get higher and higher wages and benefits … and job security, too. Unions are to blame for that. The saddest part is that it is almost impossible to fire low performing workers. They will occupy a place that could be held by somebody more productive what would tax payers save money. Ideally, the federal gov’t must be very small and very lean, and provide only a common defense, intrastate infrastructure for transportation, water, energy, communications and commerce, and tax the states accordingly for the services it provides to the states. All federal services should be managed by a few bureaucrats and provided by US based contractors. The states should make all decisions according to local needs, including education, infrastructure and taxes. Let the states compete against one-another for industry, skilled labor, tourism, universities. You have to eliminate Washington DC and New York from the data. These two very expensive areas skew the data. I’m sure this is more misinformation from people with an ideology to grind. Depends upon the division at IRS. For the customer service phones, quite a few quit voluntarily. Too many die due to ill health especially with less than 10 years on the job.